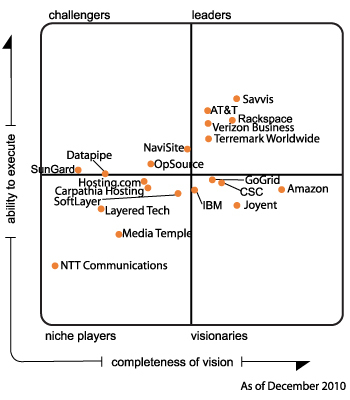 I am sure anyone interested in Cloud Computing will have seen the Gartner Iaas Magic Quadrant by this time. What was interesting to me was comparing the 2010 quadrant to 2013 quadrant. Check the quadrants below. 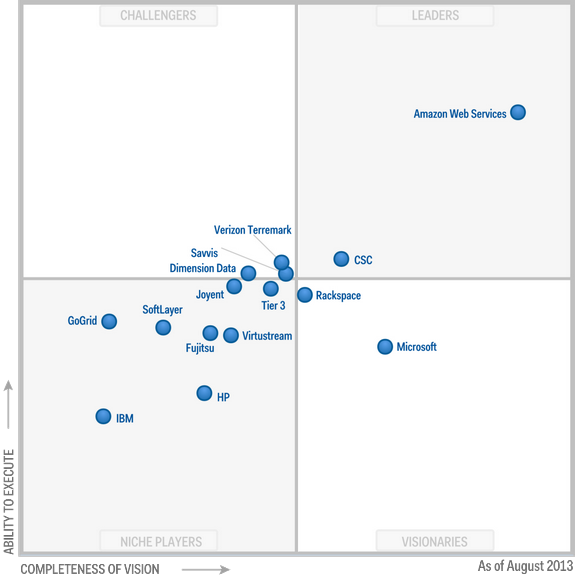 AWS was still the biggest player in 2010, but in 2013 its almost untouchable. It is THE company with completeness of vision that matches ability to execute. There is no denying that any CIO or senior management moving to cloud and going with anything else but AWS will have to seriously justify their decision. IBM has been relegated to a niche player. Even smaller players are bypassing this giant. If I were IBM top management, I would be very worried. Until now IBM has been able to get big corporations due to its reputation, but as AWS is making more inroads into Fortune 500 companies, IBM will have a horrid time. IBM acquired SoftLayer to boost its cloud credentials, but even that company is not that high in Gartner charts. It will be interesting to see if IBM can SoftLayer can make their combined offering better, or if they will again be relegated to niche players next year. Google Execution Engine, is missing from the 2013 graph, possibly because it was still in beta most of the year. Will be great to see where it stand next year. Microsoft Azure made surprisingly strong movement. Gartner thinks that it is currently second in terms of completeness of vision. Microsoft has been putting a lot of effort into its Azure business, but we will have to see if they have the technical knowhow to keep scaling. Microsoft has been known to provide patchy solutions, and if any of its cloud services refuses to scale, there can be a sudden backlash against Azure. Rackspace which was deemed a worthy competitor to AWS is also loosing momentum. It not not been able to keep up with the features released by other cloud giants. CSC is one more player that gained considerable momentum. Sometimes the cloud IaaS talk is restricted to the giants like AWS, Azure, Google, IBM, etc. but CSC is also making steady headway. It boasts customers like Coka Cola, NASA, giant insurance companies, etc. Maybe 2014 is the year when it can make its presence felt to general masses. Rest of the players like HP, GoGrid, Joyant are all again loosing momentum and will have to find niche areas instead of competing with AWS head-on. If you would like to learn more about cloud computing and such discussion, we have a course on Fundamentals of Cloud Computing. Let me know of your thoughts and please share the article if you liked it. A good read on the current IaaS players.